Hello friends ! I am back from vacation. With the post-vacation blues that we suffer every time after our return, this year we planned to come back at the time when weekend was around the corner. It was helpful as we managed to catch up on lost sleep, finish unpacking and cleaning. Now all rejuvenated to settle back into our daily routines as well celebrate the festive occasions that is spread over the whole month of Shravan. Today is Narali Purnima known as Coconut day festival celebrated mostly by fisherman from Maharashtra, marking the end of monsoon season and beginning of new fishing season. They worship the samudra dev [Lord Varun] and coconuts are offered to sea God while worshipping for their safety and good fishing business. 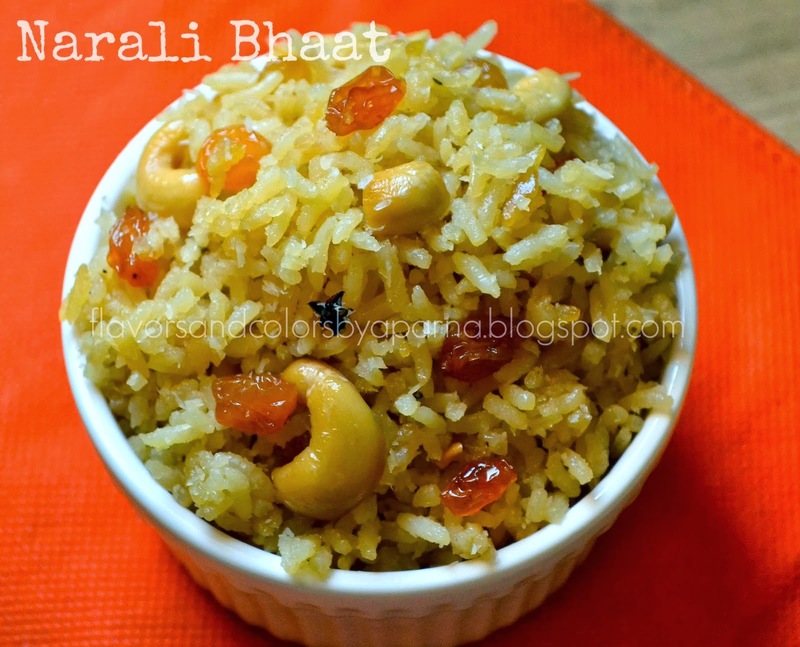 Narali bhaath aka sweet coconut rice is a sweet dish that is prepared mainly on this day. I prepared it making few variations to Mangala Barve's recipe from her book "Annapurna". Clean and wash the rice well 2-3 times. Drain the water and keep it aside for 30 minutes. Heat 2 tbsp of ghee in a deep pan. Add cloves and saute it for a minute. After this I transfer it to pressure cooker vessel, add 2 and 1/4 cups of hot water and allow the rice to cook till the grains are separate but not soft. Once cooked spread the rice on a plate and allow it to cool. 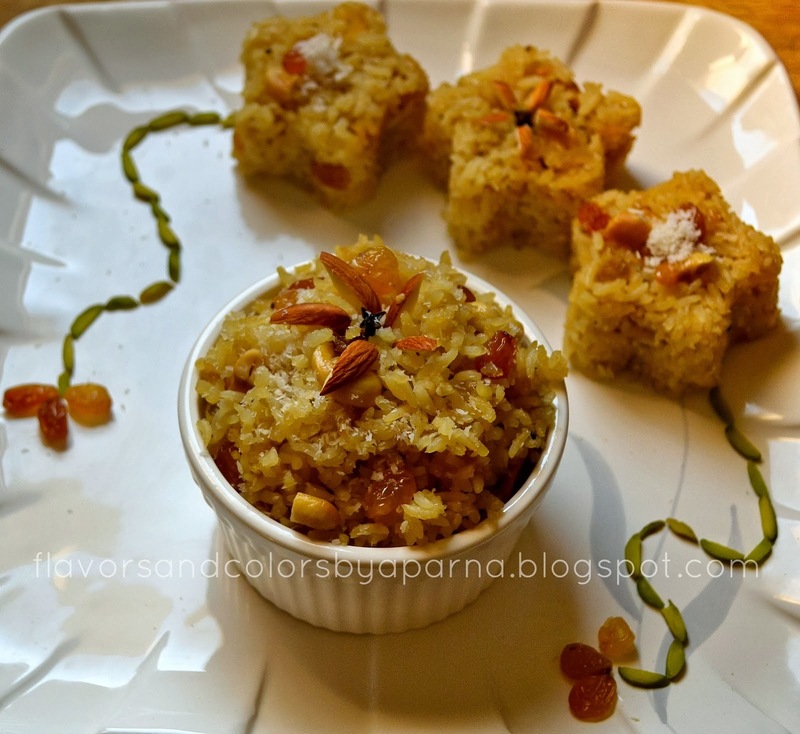 Add grated coconut, grated jaggery to the rice, toss it gently with help of fork and keep it aside. Now heat the remaining 1 tbsp of ghee in the same deep pan, fry cashews and raisins. Place them aside. Add rice, grated coconut and grated jaggery mixture in the pan. Add cardamom powder and mix gently. Cook it covered with a lid for 5 -10 minutes on sim flame [the jaggery should melt completely]. Garnish with fried cashews and raisins. Narali bhaat is ready to serve. 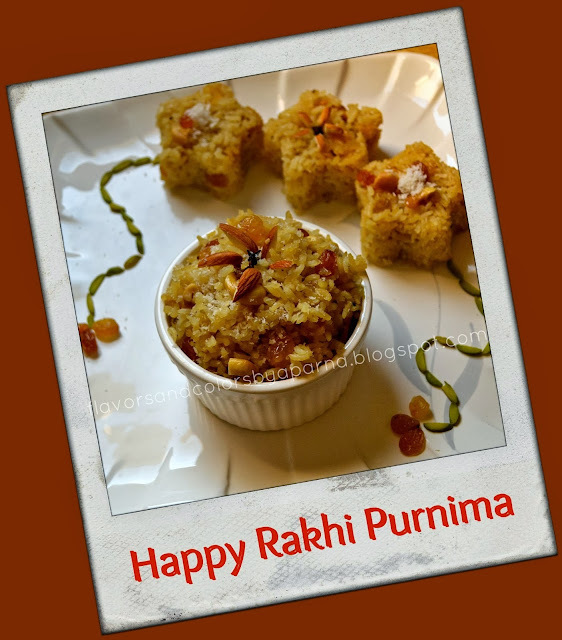 Narali Purnima coincides with rakshabandhan/rakhi purnima throughout India, to celebrate the bonding between sisters, brothers and cousins. Wishing all of you a Happy Rakhi purnima too !